Win your way to a $4500 prize package and compete in a $250,000 GTD tournament in the Caribbean this weekend at Intertops Poker and Juicy Stakes Casino. 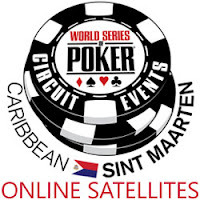 You can buy-in to Saturday's WSOPC Caribbean (St Maarten) Satellite Final, or win your way to that table in one of three qualifiers on Thursday, Friday and Saturday. "We're turbocharging this satellite series," said Intertops Poker's manager. "Usually we do a 3-tier series over a week or two. This time there's just three qualifiers and a Final all in one weekend." The ultimate winner gets a $4500 prize package to compete in the Main Event at the $250,000 GTD WSOPC Caribbean in St Maarten this spring. There you'll join two previous satellite series winners and the Intertops Poker team. The prize package includes $1700 buy-in for the Main Event in St Maarten, five nights at the newly re-built, all-inclusive Sonesta Maho Beach Resort (right across from the casino) and $600 towards travel expenses. In addition to the Main Event, there will be lots of cash games going on, so the prize package also includes one $100 cash game buy-in. The busiest poker rooms on the Horizon Poker Network, Intertops Poker and Juicy Stakes Casino are known around the world for frequent promotions and generous bonuses, and for sending online satellite tournament winners to amazing tournaments in Europe and the Caribbean. You can register for online satellites under the Tournaments tab in the poker room lobby.